So she cast a spell for a better memory. She said the magic words “Memoria memorieta memorium memoriae,” but then she forgot to throw her magic dust and the spell went wrong. And she turned into a little pig like the one on her farm. That meant that Rita the fairy had to find an antidote spell to go back to her normal human state. But in the meantime the animals played with her as if she were one of them, they sniffed at her and crowded around her because she was a new pig they had never seen before. To begin with, Rita the fairy felt very strange, but after a little while she became more comfortable with the animals and in the end decided to stay as an animal, as a little pig. She had realised that animals had feelings, and that she couldn’t keep thinking that animals didn’t deserve her attention. 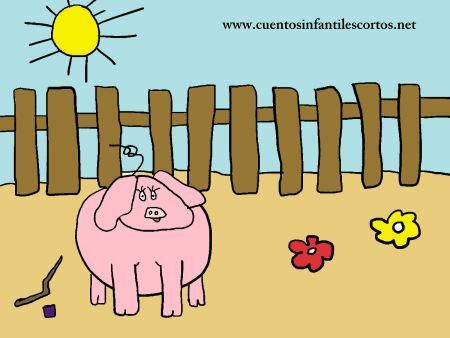 Instead, she understood that animals need a lot of love - and now Rita the fairy was proud to be a pig.